Skillet Pork Tenderloin with Cabbage: Tender pork tenderloin chops are pan seared with mustard, cider, and cabbage for a quick and healthy dinner that is full of flavor and gluten-free and low carb. I grew up in an area heavily influenced by Polish ancestors. And therefore, we ate a lot of pork with cabbage. I have to say the combination of tender savory pork with sharp, bitter cabbage is really perfect. The cabbage cuts through the pork and adds dimension to a pretty mild piece of meat. 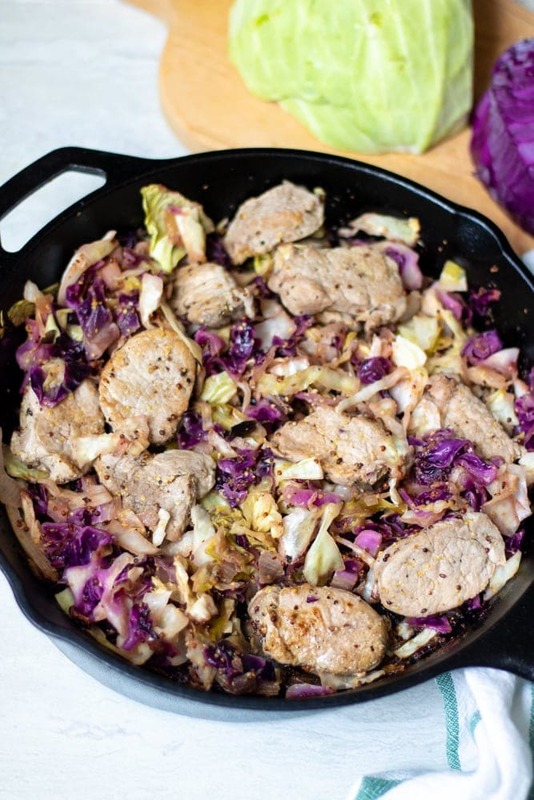 This skillet pork tenderloin with cabbage recipe is a quick version of a low and slow pork roast braised with cabbage. Pork tenderloin cooks up extremely quickly, making this meal a perfect recipe for busy weeknights. The pork is flavored mustard and then braised in apple cider with cabbage. This easy meal is savory, sweet and not to mention low-carb, paleo, gluten-free and most importantly, tasty! Slather Pork Tenderloin in 1 tablespoon mustard and 1 teaspoon salt. At this point you can leave pork in mustard marinade for up to 12 hours, but this is not necessary. Slice pork into 1 inch medallions. Sear pork tenderloin 1-2 minutes per side, or until browned. Remove chops from skillet and place onto a clean plate. Add cabbage and onion to skillet and saute for 3-4 minutes, or until cabbage begins to soften. I like to use a mixture of green and purple cabbage for color, but just one variety of cabbage is fine. Add in apple cider, remaining salt, remaining mustard and bring to a simmer. Add pork tenderloin slices back to skillet, nestling in cabbage and cider. Turn off heat and stir in apple cider vinegar. There is a huge difference between pork loin and pork tenderloin. Even though both cuts of meat are from the same portion of a pig, how they are cut and cooked is extremely different. Pork tenderloin is best cooked quickly. Pork loin is best when prepared slow-roasted or braised. You can not substitute pork loin for pork tenderloin without adjusting cooking temperature and times drastically. The USDA states that pork tenderloin is safe to eat at 145 degrees. For this dish, don’t worry too much about taking an internal temperature of the pork, these pork chops cook so fast, it is hard to under cook them. While it is easy to overcook, be sure to follow the recipe as stated for perfectly cooked meat. Heat the oil in a heavy bottom skillet or cast iron pan over medium-high heat. Slice pork tenderloin into 1 inch medallions. Add in apple cider, 1/2 teaspoon salt, remaining mustard and bring to a simmer. Add pork tenderloin slices back to skillet, nestling in cabbage and cider. Simmer for 5 minutes. Love a juicy pork tenderloin! The addition of cabbage is perfect for this dish!!! A delicious family meal, I can’t wait to try cabbage this way, it looks so good!